426. My new laptop is supposed to ship either today or in the next couple days! 427. 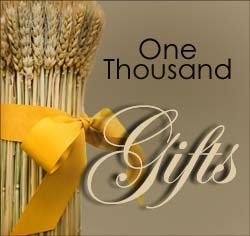 I like how this One Thousand Gifts challenge is making go through the day and see more how God has blessed me. 428. Yesterday the pastor said something that never really struck me before. Married couples tend to start to sound alike and have the same gestures, to become more like each other the more time they spend together. That’s how it is with us and God—we’ll become more like Him the more time we spend with Him. 429. I discovered that knitting is a great way to get me to brainstorm. Something about the textile action, combined with repetitive visual, allows my brain to wander and think more creatively. 430. Bible in 90 Days, days 18 and 19: “Rebellion is as sinful as witchcraft, and stubbornness as bad as worshiping idols.” I Sam 15:23. Whoa! Strong words. I want to always be obedient and pliable for God, even though I’m not always. Thank God for His grace. 431. I got more snacks for me as I write, but this time I got healthier snacks: corn tortillas and non-fat refried beans for little bean burritos, celery and artichoke parmesan dip (the dip isn’t healthy, but I don’t use gobs of it with each celery), fresh fruit, and low-fat chips. 432. I was shocked to find I’ve somehow gained 7 pounds in 3 days even though I haven’t exactly gorged myself, but it was good because it made me look for healthier snacks when shopping this morning. 435. My husband and I had a good laugh in service, although we weren’t supposed to be laughing and we were trying hard not to be obnoxious or disruptive. It was a private joke between us in response to what the pastor said, and it was kind of heartwarming to share that moment of hilarity. 437. I made cards yesterday! 438. I got up early yesterday! 439. I went to bed early yesterday! 440. We had yummy home-ground hamburgers for dinner yesterday—sirloin and chuck. Man those things are good. Juicy and beefy. 441. I ate a lot yesterday, but I didn’t eat anything after dinner—no evening snacking. 442. I remembered to post my monthly column at WordPraise, Write Time: Working Full Time and Writing. I also posted another short article on dialogue at my Story Sensei blog. 443. I had a ball at Michael’s. There were more stamps for $1 each, plus ribbon for $1 each (even though the spools are only like 3 feet long). Yarn was on sale, so I bought some for my next knitting project. 444. I unraveled my knitting and instead used a larger gauge set of needles, and it’s much better. 445. My husband suggested a handy box for my yarns, so they don’t fly all over the floor when I’m knitting. 446. Had a good time watching TV with my hubby last night. 447. I was able to listen to several RWA workshops on MP3 while I was making cards. They were very useful for helping me with my current manuscript. 448. I found a great bag for my knitting supplies. I love being organized. 449. We had yummy organic mixed greens and herbs salad for dinner, and it was wonderful. I love the flavors. 450. I had fish, Greek sandwich style for lunch. Very tasty. I need to eat more fish during the week. Why am I often hungry after reading your blog?? You're such a bad influence.